By using Foxit PDF SDK for Web, developers can deploy and customize a Foxit PDF SDK for Web that supports viewing PDF documents within a web browser. Integrating a Foxit PDF SDK for Web into a zero-footprint web app allows end users to view PDF documents on desktop and mobile devices without installing anything. Developers can easily design a unique style for their Foxit PDF SDK for Web interface, and make it consistent to their web applications. The annotations in Foxit PDF SDK for Web are consistent when viewing and editing in other applications. The core technology of Foxit PDF SDK for Web is based on Foxit’s PDF engine, which is trusted by a large number of well-known companies. 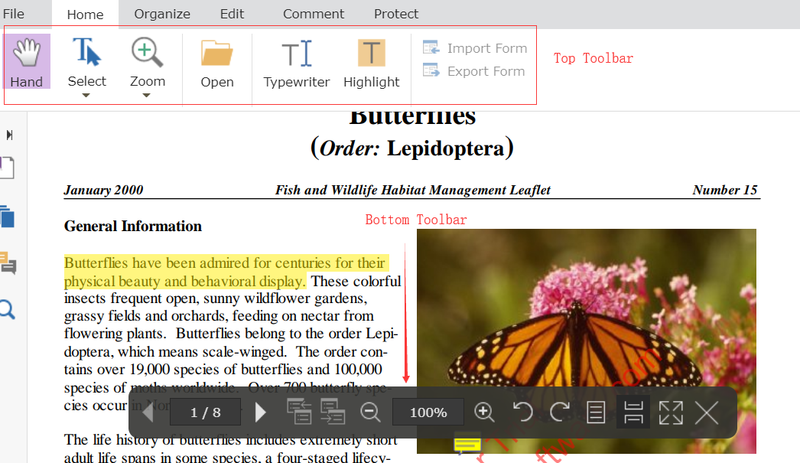 Foxit’s powerful engine makes document viewing fast and consistent in all environments. In addition, Foxit’s products are offered with the full support of our dedicated support engineers if support and maintenance options are purchased. Updates are released on a regular basis. Foxit PDF SDK for Web will be the most cost-effective choice if you want to develop a cross-platform PDF document viewing solution that can control document distribution. This document is primarily intended for developers who need to integrate the Foxit PDF SDK for Web into their web applications. It includes the direct reference examples as well as custom front-end APIs for customization. Foxit PDF SDK for Web provides a solution that enables a web application to view PDFs seamlessly without any plugins or local applications. Developers should prepare a PDF hosting server like Nginx or XAMP and do the usual configuration before using Foxit PDF SDK for Web. Foxit PDF SDK for Web provides the most common PDF viewing features and allows developers to incorporate powerful PDF technology to their applications like viewing, text searching, printing, form filling and annotating PDF documents. 22 annotation tools for editing (Highlight, Area Highlight, Underline, Squiggly, Strikeout, Replace Text, Insert Text, Note, Typewriter, Callout, Textbox, Rectangle, Oval, Line, Arrow, Polygon, Polyline, Cloud, Pencil, Stamp, Distance, Add Image). Foxit PDF SDK for Web allows users to download the trial version to evaluate the SDK. The trial version is the same as the standard version except for the 30-day limitation for free trial and the trial watermarks in the generated pages. After the evaluation period expires, customers should contact the Foxit sales team and purchase licenses to continue using Foxit PDF SDK for Web. Developers are required to purchase licenses to use Foxit PDF SDK for Web in their solutions. Licenses grant users permission to release their applications based on Foxit PDF SDK for Web. However, users are prohibited to distribute any documents, sample codes, or source codes in the released packages of Foxit PDF SDK for Web to any third party without the permission from Foxit Software Incorporated. Image resources for web viewer. Wrapper page for Foxit DRM. The PC HTML entry file for the basic demo Viewer. The default English language file. You can use http -server to start a simple local web server, and then run Foxit PDF SDK for Web Demo. In the following working example, npm package is assumed to be available on your system already. As the above example shows, the local http server is available on port 8889. Now you can run the Demo at http://127.0.0.1:8889. Create a new directory as a project folder, such as D:/www. Download FoxitPDFSDKForWeb.zip, unzip it to D:/www/lib for example. If you are on port 8080 for example. 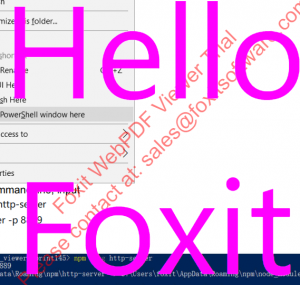 You can access the Foxit PDF SDK for Web Demo at http://localhost:8080/index.html after setting up the HTML page. Now Let’s add elements to the html page step by step. Add a style to the tag of the HTML page. •	jquery.js: Required by Foxit PDF SDK for Web, so it must be included. •	webpdf.full.mini.js: SDK core library file. •	toolbar-config.bundle.js: Contains the initial toolbar layout and settings. If not referenced here, viewer will be loaded without toolbar. •	demo-license-key.js: Store the license information with a global variable window.demoLicenseKey. If not referenced here, demo will not be licensed. Add the following script to create a new instance of Foxit PDF SDK for Web and load a document. The ‘doc’ should be the path to one of your PDF files. A license string is included in the ‘sdkkey.txt’ that you will receive via Email once purchasing the SDK. Find and open the ‘sdkkey.txt’, copy this string, open “..\scripts\demo-license-key.js” and paste it in the required place as shown in the following code. Create a Nginx configuration file, for example FoxitWebPDFjs.conf. Set up a virtual server and configure a location. The example below demonstrates the access to your own HTML page. 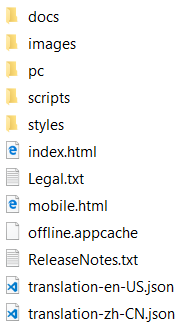 The ‘index.html’ is your web page, and ‘D:/www/’ is your built project directory where the SDK folder resides in. The example below demonstrates how to run SDK index.html directly. The ‘D:/WWW/Lib’ is the path to the SDK. Assuming XAMPP was installed on D:\xampp. WebPDF.ready is the SDK entry point. In the API reference, except for the version, onReady, and ready in the namesapce ‘WebPDF’, all the other namespaces and variables that will be mounted after the .ready call. The first parameter docViewerId receives is the DOM id name of the web viewer. The second parameter supports a series of initializing options. Except for the licenseKey (which is mandatory), these parameters are optional. Before you initiate the SDK, you can set options once the DOM is located. Only the option licenseKey is obligatory for authenticating Web SDK, the others are set according to your needs. The following code snippet demonstrates we want web viewer to use the browser’s top language, load the default toolbar configuration, use the font from the Foxit font server to render the PDF and load license key for SDK. For more options, refer to WebPDF in the API References. On the default demo viewer, you can click on Open to open a local PDF or open a PDF by URL. You can also programmatically open a PDF by using openFileByUri to open a PDF file from a file hosting system. Or using openFileByStream to open a PDF from stream. The following code snippet demonstrates how to load the sample document “sample.pdf” from stream. When opening a large file, the best practice is to enable asynchronous loading mode in Foxit PDF SDK for Web and enable Range request header in the file hosting server. In the async mode, the viewer will make bytes range requests to download portions of content and render instead of loading the entire file before rendering. In async mode, the document is read-only. fileSize: 400r, // When a file reaches this size, start async loading. The RFC2616 specification defines the range protocol, which gives a rule that allows the client to download only a portion of the complete file at a time. This allows the client to download a file while multithreading is enabled, where each thread only download parts of the file, then assemble into one complete file. Range also supports breakpoint transmission. As long as the client records the downloaded file offset, the client can request the server to send the file on the breakpoint. Foxit PDF SDK for Web is a browser-based application. It doesn’t implement the saving annotation feature in the viewer demo. 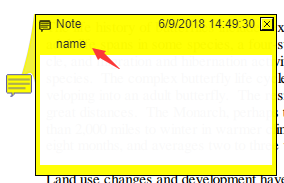 As such, to save the annotation changes in demo, you can either click Download to save the changes to current PDF and save as a local copy or click Export to save annotation in a type of data format. You can also use “export/import” APIs to implement programmatically annotations loading and exporting. For more information, refer to Importing and Exporting. WebPDF.ViewerInstance.exportAnnotsToXFDF()//Export and download to the local machine. Foxit PDF SDK for Web provides rich APIs to import and export annotations and form data. The supported data formats are: FDF, XFDF, JSON and XML. The code sample below demonstrates methods to import annotations from XFDF and export annotations to JSON. Duplicate ‘translation-en-US.json’ and rename as ‘translation-abc-Lng.json’, where abc-Lng is your language. Translate the resources with your language. Remove or rename other language files. Your ‘translation-abc-Lng.json’ file will be used by SDK. If you want to keep the other languages but call your built language, you can set options in the WebPDF.ready. The default demo viewer will be read-only once it is in offline mode. User operations involving network resources reference like font loading will suffer failures. Foxit PDF SDK for Web Demo provides a default toolbar global configuration file called ‘..\scripts\control\toolbar\toolbar-config.bundle.js’, through which you can customize both the top toolbar and bottom toolbar. You can modify the toolbar-config.bundle.js to redefine or add a button. You can also create a new toolbar.config.js file with your own configuration. You may configure the global variable object in the ‘ toolbar-config.bundle.js’’, and declare this file in the entry HTML file, then pass the toolbar-config.bundle.js to WebPDF.ready to see the toolbar configuration take effect. For configuration samples, refer to .. \docs\tutorial\toolbar_en.html. Use WebPDF.Toolbar.getRegistry() to register the component. See Custom Component Samples in the ‘toolbar_en.html’. Use WebPDF.Toolbar.getRegistry() to register the controller. See Custom Controller Samples in the ‘toolbar_en.html’. Add the following config into the corresponding tab section in the ‘toolbar-config.bundle.js’. The sample code below, where the ‘custom_button’ corresponds to the name of the custom component and ‘myswitcher’ is the name of the controller. For detailed guide sample, refers to ‘toolbar_en.html’. In the Demo.js, modify the saveuserdata data to ensure that the data source is consistent with the save location. With the default demo viewer, you can rotate the page view 90 degrees by right-clicking on a page. To programmatically rotate a page view, call the “WebPDF.ViewerInstance.rotate()” after the WebPDF.ready. The Zoom group includes tools like Zoom in, Zoom Out, Fit Width, Fit Page and zoom levels. In the default demo viewer, you can click on the plus and minus buttons to zoom in and out of the document, or select a zoom level by choosing a specific value from the drop-down list. To programmatically implement zoom, call the “WebPDF.ViewerInstance.zoom()” after the WebPDF.ready. Enlarge the page according to the array value returned by WebPDF.ViewerInstance.getZoomLevels(), and will not continue to zoom in if the current zoom ratio is the maximum. Shrink the page according to the array value returned by WebPDF.ViewerInstance.getZoomLevels (), and will not continue to zoom out if the current zoom ratio is the minimum. Fit to width, zoom ratio is adaptive to browser width changes. 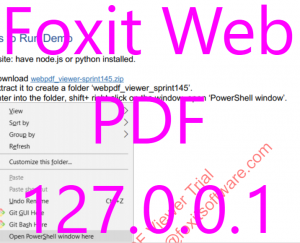 Foxit PDF SDK for Web implements Download function. At some cases you may need to disable it. The following shows a way of disabling the Download. You can also gray out the Download function through User Permission. Foxit PDF SDK for Web implements the Print function. At some cases you may want to disable it. The following shows a way of disabling print. You can also gray out the Print function through User Permission. If you have your own user system, you can programmatically configure user settings for specific users or for all users by the user-related APIs in SDK. Programmatically set the default attributes for annotations. For more information about configuration properties, refer to WebPDF.Config.UserData in the API References. //an example of setting default attributes for highlight. The user permission is different from the document permission, which is just for display presentation, not modifying the document. For more permission options, refer to API References. // assign users all permissions WebPDF.ViewerInstance.setUserPermission(-1). // assign users read and modify annotation permissions, the user's permission value settings are cumulative, the print button on the toolbar will be disabled. The user watermark is different from the document watermark, which is just for displaying presentation, not modifying the document. The settings will be saved in the memory and applied when a document is re-loaded. You can programmatically insert pages into the current document from another document stream. Once the pages were successfully inserted, the modified new document is opened. For the supported parameters to insert pages, refer to WebPDF. Viewerinstance in the API Reference. Flatten annotations and form fields by the specified range and return the new file stream after the file is processed.